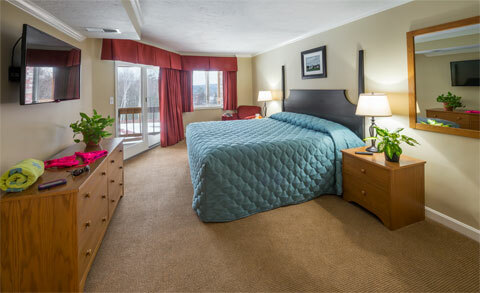 The Summit Resort offers spacious 2 bedroom accommodations conveniently located in the heart of the Lakes Region near Lake Winnipesaukee. All suites include full kitchens and a relaxing balcony to take in the fresh air. Each of our suites accommodates up to 6 guests and all guests are free to use all amenities at the resort. 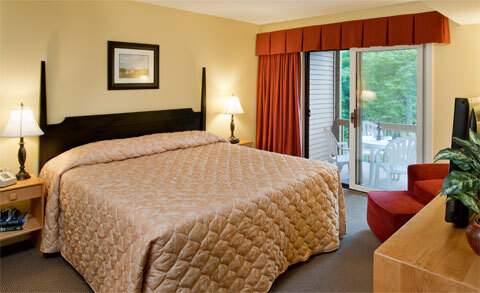 The Summit’s 2 Bedroom Signature Suites offer the highest standard of resort accommodations in the Lakes Region. These spacious units sleep up to 6 people with a king sized bed in the master bedroom, a guest bedroom furnished with 2 twin sized beds and a queen sized pullout sofa in the living room. Room amenities include a full kitchen, in-room washer and dryer, an electric fireplace in the living area, a Jacuzzi tub in the master bathroom with a shower, 2 flat-screen TVs and a relaxing balcony. The Summit’s 2 Bedroom Deluxe Suites represent our middle tier accommodations. These spacious units sleep up to 6 people with a king sized bed in the master bedroom, a guest bedroom furnished with 2 twin sized beds and a queen sized pullout sofa in the living room. Room amenities include a full kitchen, in-room washer and dryer, an electric fireplace in the living area, a Jacuzzi tub in the master bathroom with a shower, a flat-screen TV and a relaxing balcony.